I’m venturing back into the land of speculative paleontology with a modest suggestion about the reason why two groups of aquatic Mesozoic animals had ridiculously long necks. Some of these animals are very familiar: plesiosaurs. Some Plesiosaurs, members of the Plesiosauroidea, had ridiculously long necks. This trait was shared with the lesser known Triassic Tanystropheids, such as Tanystropheus longobardicus. Their necks are typically relatively stiff and weakly muscled, which gives rise to real questions about how the animal used them. Plesiosaurs, for example, could not raise their necks out of the water in the classic Loch Ness Monster or “swan” pose, nor could they sinuously retract their necks as if they were snakes’ bodies. Tanystropheus’ neck was even more limited, being compared to the stiff tails of hadrosaurs. How did they use these necks? Proposals include Elasmosaurus “conceal[ing] itself below the school of fish. It then would have moved its head slowly and approached its prey from below” (from Wikipedia) to Tanystropheus fishing from marine shores as some sort of dipsy-diver, dropping its head down into the water from above. More bizarrely, taphonomic evidence in the form of fossilized sea floor gouges suggests that Plesiosaurids with long stiff necks were benthic feeders like rays or grey whales, grabbing their prey out of the mud (from Tet Zoo 2.0). It is hard to image an animal less adapted to such a hunting mode. This doesn’t even get into the exquisite vulnerability of this body shape. Long, thin, stiff necks are very vulnerable to aquatic predators. Indeed, multiple artists have illustrated elasmosaur necks as the chew toys of large pliosaurs, and it is hard to imagine Tanystropheus surf fishing without getting its neck dislocated. I’d like to suggest a different hypothesis, that these long, stiff necks were perfectly functional, and that, indeed, there are animals today that have similarly constrained morphologies. They aren’t tetrapods though, they’re fish. Electric fish, to be precise. Electrogenic organs have evolved at least four separate times in fish (Gymnotiformes, Mormyridae, Malapteruridae, Torpediniformes), and occur in both salt and freshwater. The South American knifefish (Gymnotiformes) are a particularly good example. As a group they have linear, fairly stiff, poorly muscled bodies. The apparent explanation for their shapes relates to the complexity of interpreting information from electric fields, and simpler body shapes make for more unambiguous signals. It appears that most electrogenic animals (animals that actively generate an electrical field for sensory purposes) have stiffer bodies with simpler shapes than do their less shocking relatives. This is also true for manmade electrogenic sensors, as a simple shape makes for a simple, easily interpretable field. If the long stiff necks of Plesiosaurids and Tanystropheids are electrogenic organs, the weaknesses of the necks become strengths. Their necks’ main job is to be held stiff and straight in the water, and they appear well-built for this task. Moreover, electrogenic organs are built from stacks of electrocytes, which were the inspiration for batteries. The longer the neck, the more “batteries” it can hold, the bigger a field it can create, and the higher a voltage it can generate. The advantages don’t stop there. Electrogenic organs have three potential functions: sensing, electrofishing, and defense, and I will explore each in turn. Many animals can detect electrical fields, with or without special organs. Humans can detect sufficiently strong electric fields, while everything from catfish to sharks and rays to platypuses and river dolphins have structures specialized in passively detecting weak electrical fields. Electrogenic animals all actively use their electrical organs to sense their environments, feeling differences in the field due to the presence of things that either are either more or less conductive than the surrounding water. They can also detect the electrical fields innately given off by all animals through things like muscular exertion, heartbeats, or (in fish) the gill area. All of this adds up to a sophisticated electrolocation sense. This is particularly important for animals that hunt in waters where vision is limited, either through turbidity or at night. It is also quite useful for hunting animals buried in the sediment, which is an explanation for the Jurassic sea-floor gouges caused by Plesiosaurids. In an attempt to illustrate this, I chose the small (30 cm long) tanystropheid Tanytrachelos. This species was found in the Triassic, in the Solite Quarry in Virginia. It was apparently amphibious, for it was found in the sediments of a highly seasonal lake, and its webbed footprints are found fossilized in lake mud. Its main prey were apparently insects, and it apparently co-occurred with the fish Turseodus, of approximately the same size. Given the description of the lake sediments (alternating layers of mud and decayed vegetation), I suspect that the water wasn’t terribly clear, as it has been illustrated. The lake water may have been stained tea-brown by tannins, or it may have been muddied by rain and animal activity. Either way, I would suggest that Tanytrachelos was something like a platypus, an aquatic insectivore that found its prey using their electrical fields instead of eyesight. I should note that all the long-necked species probably used electrolocation. It doesn’t take a large electric organ, and in turbid or dark environments it can be critical. It’s also possible that a majority of Plesiosaurids and Tanystropheids were electrolocators only. In modern electric fish, a majority are electrolocators, not active shockers, and there’s no reason to think this was different in the past. Certainly there is a tradeoff between carrying an electric organ and using a neck for something else, and there’s no reason to expect them all to be electrofishers. But some could have been. Here, I would like to compare the fish biologists’ standard sampling tool, electrofishing, with the biological versions. While it is not clear that electric eels hunt with their electric organs, marine torpedo rays certainly do. However, the best insight comes from human electrofishing. For those who are not familiar with it, electrofishing involves using a generator, a transformer, and at least two electrodes. When the system is properly tuned, fish are stunned and can be captured for population samples. Most electrofishing rigs work in freshwater, but several research groups practice marine electrofishing. Still, there are a number of complexities. Human electrofishing works on a simple principle. Many fish, when caught in a pulsed DC field between a cathode and an anode, involuntarily swim towards the anode, a phenomenon called positive electrotaxis that is caused by involuntary muscle contractions in the fish. Fish biologists use this trick to draw fish into the anode area without killing them, so that they can count and measure them. Translating this to electrofishing animals, I propose that the animals used pulsed DC current, with the anode located immediately behind the head. If one looks at the field lines, this would cause fish to swim uncontrollably straight into the predator’s mouth. Additionally, electrofishing rigs are deliberately designed with the anodes as large as possible to avoid damaging the fish (reference). One could easily argue that the long, slender necks with small heads of animals like Elasmosaurus or Tanystropheus are the exact opposite, with small anodes evolved to stun, injure, or even kill the the prey before it reaches the predator’s mouth. I used Tanystropheus in the cartoon below to illustrate the principle, with the anode behind the animal’s head. Tanystropheus electrofishing, with the anode behind the head. While this is simple in theory, it becomes complex in practice. For one, seawater conductivity varies depending on temperature and salinity. For another, fish catchability varies depending on the ratio of conductivity between the fish and the water, with a maximum efficiency where the fish has the same conductivity as the water. There are other factors, such as the frequency of the pulsed DC current used, which varies by fish targeted (usually determined empirically by biologists), and factors such as the thickness of the fish scales (thick-scaled fish are harder to catch this way) and the size of the fish (larger fish are more vulnerable than smaller fish) (reference). As an aside, it is not clear whether electrofishing works on squid or insects, apparently due more to lack of experimentation than anything else. Thus, there is no one optimal design for electrofishing animals. Plesiosaurids could not broadly harvest every fish in the water, but would be constrained by how they could adjust to factors like salinity and the fish present, and I suspect that the substantial diversity they show represents adaptations to different electrofishing strategies. Most likely, the biggest plesiosaurids would have to migrate frequently to avoid fishing out local habitats and to take advantage of spawning clusters or feeding congregations, much as large sharks do today. Since a proportionally bigger electrofishing rig is required for oceanic uses, it suggests that freshwater electrofishers should have proportionally shorter necks. This appears to parallel the fossil record, where known estuarine or freshwater species have shorter necks than do marine animals. As an aside, I get the impression that Mesozoic fish had thick scales compared to those of today. While this may be erroneous, it is possible the Plesiosaurid electrofishing caused adaptive pressure on Mesozoic fish to favor thicker scales than we find today. Why are there so few electrofishing modern animals? I would suggest that the answer is aerobic capacity. Electric eels reportedly get 80% of their oxygen from the surface. They are air-breathers, more than some amphibians, but torpedo rays (the other electrofishers) are not. While I’m not aware of any physiological studies, large electrical organs have to be metabolically expensive, and being air-breathing does make it easier to power them However, electric eels are stuck morphologically, because they have to cram their all their organs into a shape optimized for electrogenesis, and they have heavily vascularized oral cavities rather than true lungs. Air-breathing reptiles are not so constrained. Better still, their electrical array is physically separated in their necks, away from their heart, lungs, and swimming fins, allowing each system to work separately with fewer morphological constraints. As a result, they could grow much larger than electric eels or any modern electric animal. As for how Plesiosaurids avoided electrocuting themselves with their own voltage, all I can say is that electric eels somehow get away with it, so presumably it’s quite possible. 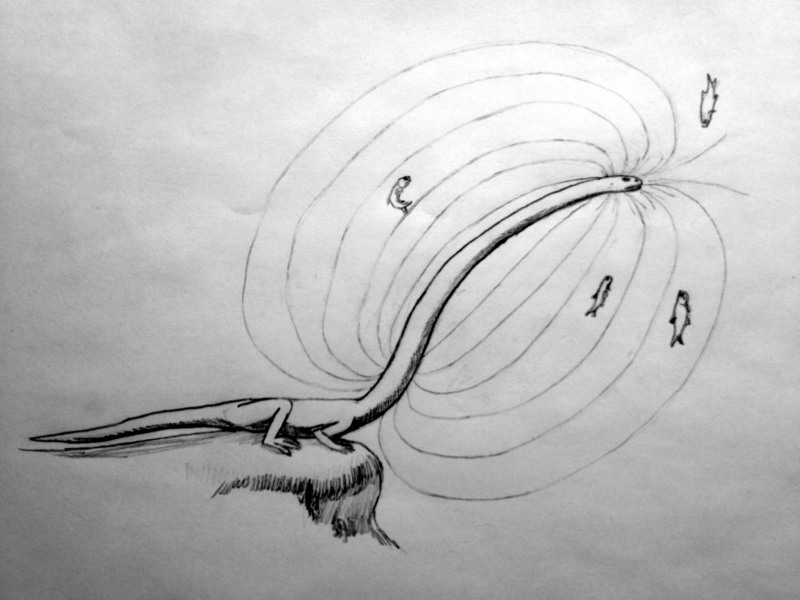 Some electrolocating fish have encephalization quotients close to those of humans, so it’s unlikely that electrogenesis would be a problem for Plesiosaurid nervous systems. This is a normal outgrowth of electrofishing, although current characteristics probably differ. Indeed, more modern electrogenic animals use these organs for defense than for food gathering. This is the classic electric eel defense, and I suspect that any electrofishing animal could effectively defend its neck from larger predators. A pliosaur attempting to bite down on an electrogenic elasmosaur would be in for a nasty shock. 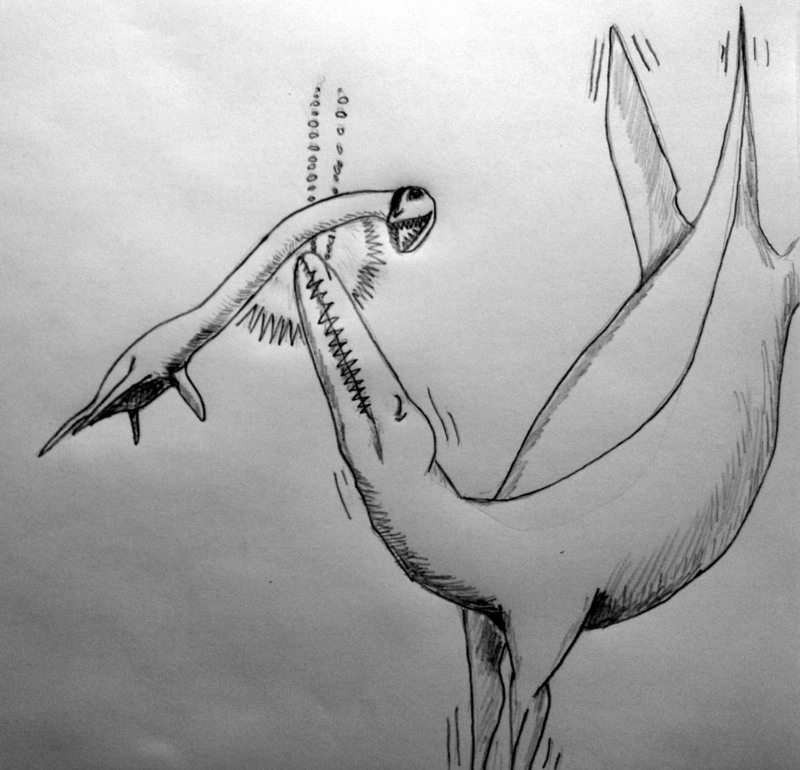 I’ve attempted to illustrate that below, with my cartoon of what might happen when a Pliosaur attacks an Elasmosaurus. Of course this is all speculative, soft-organ paleontology. I haven’t been able to locate a picture of an electric eel skeleton, so I have no idea how electric organs affect bone shape, or whether it’s possible to determine the presence of an electric organ from any skeleton. Some Plesiosaurid neck vertebrae are described as “odd and asymmetric”, but I have no idea whether this could be due to the presence of an electric organ or anything else. Still, the strength of this hypothesis is that it presents a good explanation of why both Plesiosaurids and Tanystropheids have long, weak, inflexible necks, and it also accounts for how such an animal could be an efficient aquatic or benthic hunter. As such, it is certainly no worse than the idea that they are stealthy hunters, with their bodies hidden by their long necks so that they appear smaller. In fact, it makes them seem rather formidable. Electric sea dragons, anyone? Bakker, Robert. 1986. The Dinosaur Heresies. Zebra Press. Fraser, Nicholas. 2006. Dawn of the Dinosaurs: Life in the Triassic. Indiana University Press.